Mohamed Salah, with his 31st of the season, again got on the scoresheet, while Emre Can, Roberto Firmino and Sadio Mane also struck. West Ham hit the bar through Marko Arnautovic in the early stages, but were outplayed and managed just a consolation through substitute Michail Antonio. 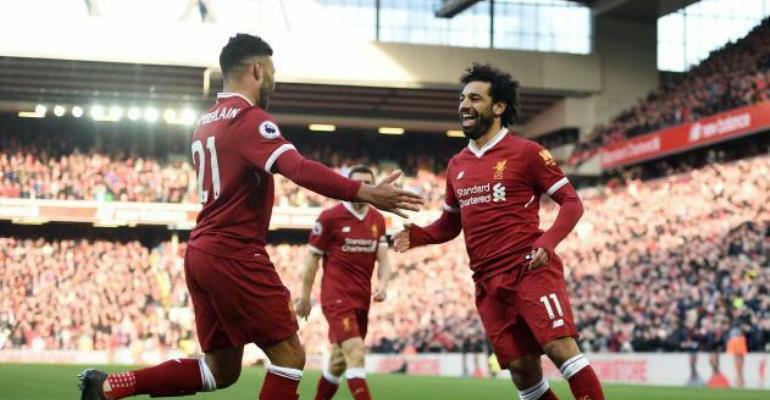 Liverpool, who also won 4-1 at the London Stadium in November, were dominant and could have had more for their efforts, with both Salah and Mane striking the woodwork. The Hammers, whose supporters wore T-shirts commemorating the 25th anniversary of Bobby Moore’s death, offered little and the result prolonged their manager David Moyes’ miserable record at Anfield. The former Everton and Manchester United boss has now not won at the ground in 15 attempts. Glenn Murray scored twice as Brighton gave their survival hopes a shot in the arm and brought Swansea’s revival to a halt. Murray’s double and goals from Anthony Knockaert and Jurgen Locadia helped secure a 4-1 victory and a valuable three points for the hosts, as the Swans’ 10-game unbeaten run in all competitions came to an end. The World Cup may be a pipe dream for 34-year-old Murray, but he now has 10 Premier League goals this season and only three Englishmen – Harry Kane, Raheem Stirling and Jamie Vardy – have scored more. With a daunting run-in which sees them face Tottenham, Manchester United and Liverpool in their final four matches, this was a huge victory for Brighton. They are now up to 11th, four points clear of 18th place, which is occupied by their beaten opponents Swansea. Dan Gosling struck a dramatic late equaliser against his former club as Bournemouth battled back from two goals down to draw 2-2 with Newcastle. Magpies striker Dwight Gayle looked to have earned the visitors three precious Premier League points on the south coast with two simple, first-half finishes, but they made to pay for their profligacy, which included Jonjo Shelvey missing an open goal at 2-0. Victory at the Vitality Stadium would have moved Newcastle level on points with their hosts, but Rafael Benitez’s men will continue to look anxiously over their shoulders at the bottom three following their late capitulation. Rock-bottom West Brom’s troubles continued as they were beaten 2-1 at home by Premier League relegation rivals Huddersfield, their fifth successive loss in all competitions. Strikes from Rajiv van La Parra in the 48th minute and Steve Mounie in the 56th put Huddersfield 2-0 up. Craig Dawson replied with a header in the 64th, but West Brom could not muster anything further as the pressure increased on boss Alan Pardew. In a contest where Albion fans made their frustration heard in various ways, there were chants of “you’re getting sacked in the morning” directed at Pardew towards the end, and loud boos rang around The Hawthorns at the final whistle. The result leaves the Baggies – who have won just one of 14 league games under Pardew – still seven points adrift of the safety, with 10 matches left to play. Manolo Gabbiadini’s late heroics earned a point for Southampton which moves them out of the relegation zone. The hosts had been all set to secure their first win of 2018 through Ashley Barnes’ opener midway through the second half. But Gabbiadini equalised in the 90th minute to earn the visitors a draw. – Earlier on Saturday, a howler from Jack Butland cost Stoke City three points against Leicester City. The post EPL on Citi: Liverpool rout West Ham, Atsu’s Newcastle slip up appeared first on Ghana News .